Ace veena player and music composer Rajesh Vaidya has come out with a music album. Titled 'Seventh Sense', the album has been conceived as a fusion of Classical and Western rhythms. The audio brought out by Amutham features seven tracks each dwelling on a particular Raaga. "It was my desire for the last few years to try out something different. The idea of doing a fusion album struck me and I asked Sudha Raghunathan to join me. 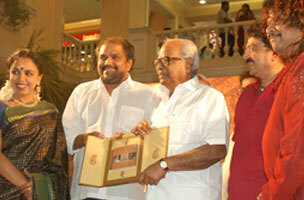 She agreed readily and rendered a Bharathiyar song Chinnanchiru Kiliyae," says Rajesh Vaidya. On her part, Sudha Raghunathan says, "It was a delight to be part of a project involving Rajesh Vaidya, who mesmerised all music-lovers with his veena over the years." The album was launched in Chennai on Friday in the presence of veteran filmmaker K Balachander, music composer Vidyasagar and Mylapore MLA S Ve Shekher.